Legendary producer Roger Corman has, over the years, lent his name to so many projects that most of the time he has little if any involvement with the movie but for whatever reason, The Living Dead was different. Though the project is produced by China's ACE Studios, the premise comes from Corman who rather than stay hands off, was very involved from the get go, at first refusing the director, reportedly demanding the reworking of some CGI and changes to the story that, as director Antony Szeto describes it, will annoy Chinese audiences watching The Living Dead. THR has a great rundown of the production, including more details on changes Corman requested. 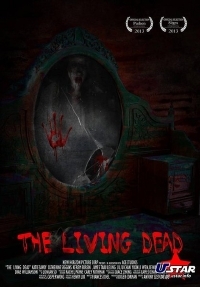 As for The Living Dead, the movie revolves around a group of American documentary filmmakers who are in China to shoot a film about the Chinese Ghost Festival but find their project veering off track, plagued by a vengeance seeking female spirit murdered a century ago. It's a cheesy looking venture and one that, from the look of the trailer at least, doesn't offer much in the way of scares but Corman fans will have a chance to see the movie when it's released in the US under the title Hell's Haunted Palace. As for Corman, he's not done with China just yet. He and director Szeto have nearly completed a second movie, a martial-arts project titled Fist of the Dragon.